Contribute to 401(k) or Pay Off Student Loans? The age old question: dig yourself out of debt or contribute to your financial future? Hear's why it's a good idea to do both. At a high income level, it may seem obvious to maximize your tax-advantaged accounts. However, many readers struggle with student loan debt (even when they’ve refinanced their law school loans) and consciously make a decision to forgo 401(k) contributions to instead accelerate debt repayment. When I was a junior associate, I chose to prioritize student loan debt repayment. In hindsight, I should have been doing both. A Biglaw salary is plenty of money to contribute the maximum to a 401K and still have plenty left over to send to student loans. Here’s the article I wish I would have read when I first started in Biglaw. Contributing the maximum amount to your 401K means paying $1,500 a month in pre-tax dollars ($1,500 × 12 months = $18,000). According to an online calculator, a typical first year associate would see a reduction in their monthly take-home pay of about $900. In other words, you give up $900 from your monthly paycheck but see $1,500 deposited into your 401K. $900 is not a lot of money, especially when you’re jumping from making $0 to making $160,000 (update: now $180,000 thanks to the 2016 market raises). You won’t miss the money. Taxes are a major drag on your ability to accumulate wealth. There’s two concepts to understand before we go any further: marginal tax rate and effective tax rate. Marginal Tax Rate. 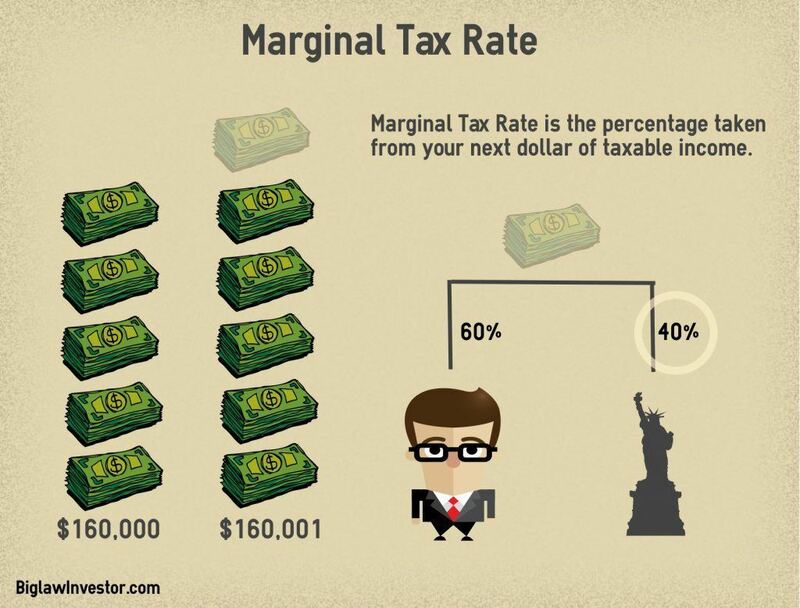 Your marginal tax rate is the percentage taken from your next dollar of taxable income. In other words, if you earn an additional dollar how much will go to taxes? Effective Tax Rate. 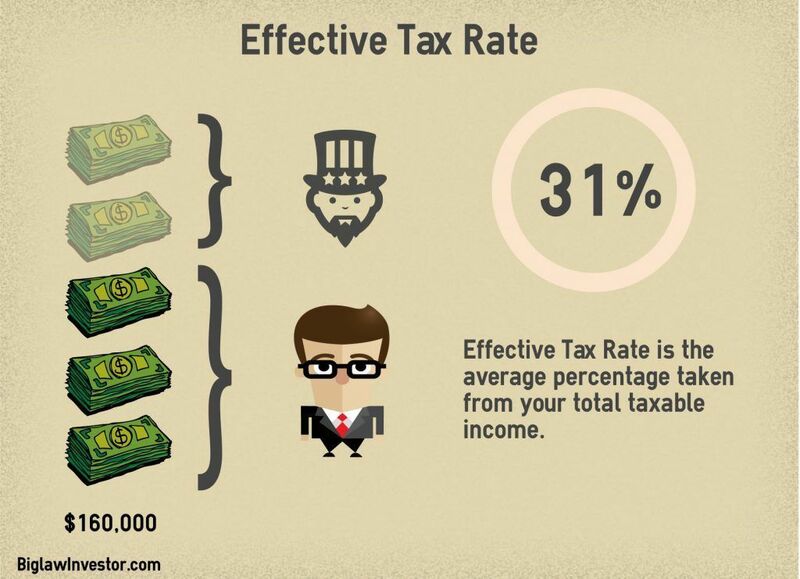 Your effective tax rate is the average percentage taken from your total taxable income. In other words, what percentage of your total income is paid in taxes? Why is There A Difference? There’s a difference between your marginal tax rate and your effective tax rate because the United States tax system is progressive. You pay 10% on your income between $0 and $9,275. You pay 15% on your income between $9,275 to $37,650, etc. If you think about earning dollars throughout the year, it’s easy to see that the first dollars you make are taxed at a lower rate than the dollars you earn at the end of the year. Let’s assume you have a marginal tax rate of 40% (including state and local taxes). A 40% marginal tax rate means you will pay $0.40 in taxes for each additional dollar earned. Saving for retirement means diverting those very last dollars into a tax-advantaged account where you pay no income taxes. Therefore, you’ll save $0.40 for each dollar deposited into a retirement account. But, Won’t I Pay Taxes on Withdrawal? Yes. 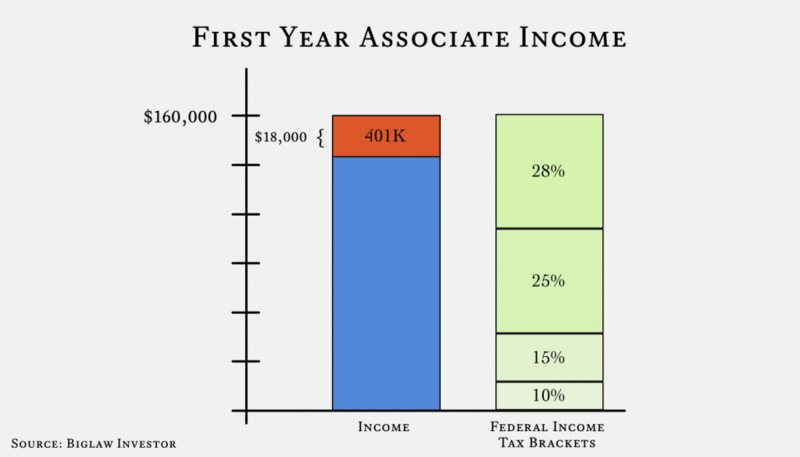 Funds in a 401K grow tax free, but are taxed as income at the time of of withdrawal. You can’t escape paying income taxes on this money. The key concept is that when you contribute to a 401K you save paying taxes at your marginal rate, but when you withdraw from your 401K you will pay taxes at your effective rate. Let that sink in. It’s the most important point in the post and a point I missed as a junior associate. It’s a great deal to avoid paying 28% (plus state and local taxes) now if you will only pay 10% tax later. You’re taking advantage of tax arbitrage. In retirement, not only will your effective tax rate be lower than your marginal tax rate today (even if taxes go up), but you may be living in a lower tax environment. For example, I work in NYC (Federal/State/City Tax) but will probably retire somewhere warm. Neither Florida nor Texas have state income taxes. My marginal tax rate today is 45.848% (keep in mind that you still must pay FICA taxes on 401(k) contributions). I’m confident my effective tax rate will be lower in retirement. Some of you might be thinking that it’s possible my marginal tax rate might be higher in retirement. Tax rates could go up. I could retire in NYC. My income could be large. Those would all be good problems to have (except higher tax rates) and don’t change the calculus that it’s much more likely that your marginal tax rate today is higher than your effective tax rate in retirement. If you decline to participate in a 401K plan in any given year, you do not have an opportunity to participate in the future (i.e. other than being able to contribute an extra $6,000 after the age of 50, there are no catch-up provisions). When you’re young, you may think that this isn’t too important. It’s actually very important. By skipping a year of contributions, you shorten the time horizon for your investment returns. As a young investor in the accumulating phase, your greatest asset is time. You want your dollars to work for as long as possible, thus taking advantage of the value of compound interest. Bill is 30 years old. He will begin withdrawing from his 401K when he reaches 65, giving him 35 years of growth. Alice is 30 years told. She will begin withdrawing from her 401K when she reaches 65, giving her 35 years of growth. Unlike Bill, she decides to delay contributing to her 401K account for only 1 year. Bill contributes $18,000 each year for 35 years. He has $2,488,263 when he turns 65. Alice contributes $18,000 each year for 34 years. She has $2,308,657 when she turns 65. Not contributing in year 1 results in a $179,606.04 loss by shortening the growth of your money between year 34 and 35. For each year you don’t contribute, you’re cutting off a year at THE END of the growth chart. You own the money in your 401K account and can always access it. Money that is withdrawn prior to the age of 59.5 typically incurs a 10% penalty tax unless a further exception applies. So while it’s not an elegant solution, you have access to this money should you absolutely need it. Setting up your 401K account today will help you grow into your income. Because $160,000 is more than you’ve ever made in your life, you will not miss the money deposited into your 401K. Do this even if it slows down your loan repayment. Do this even if you think you might leave Biglaw in 2 years. Your income is too high not to take advantage of the tax shelter. Sometimes people decide not to contribute to their 401K plan because they don’t like the fund options. The 401K plan may have high fees or offer lukewarm investments like industry specific funds rather than broad index funds. This is a reasonable concern. Paying high fees will have a major impact on your future returns and you should minimize them. However, the advantages to contributing to a 401K plan far outweigh the drag caused by an excessive fee of 1-2% per year, particularly when you are in the accumulating phase. Most 401K plans will have at least one low-cost index fund, even if it’s the S&P 500. If that sounds like your plan, pick the S&P 500 Fund and max it out. When you leave the firm, you will have the opportunity to roll your 401K account to a new provider where you can make better selections. Let’s talk about it. What do you think? Have I convinced you to max out your 401K plan each year? Let us know in the comments. If you’re not maxing it out, let us know why. Nineteen thoughts on Contribute to 401(k) or Pay Off Student Loans? I wasn’t maxing out my 457 plan until recently, mainly because my income wasn’t that high. I’m a big fan of maxing out tax advantaged plans though, and even encouraged my co-worker to start contributing to the plan. Because of the pre-tax nature, the reduction in your paycheck is not as significant as you may think. Definitely think it’s a great idea if you plan on moving to a state with no income tax. Even if you’re not moving to a state with no income tax, I think people overestimate how large their income will be in retirement. Once you’re done saving for cars, houses, retirement, paying taxes, etc., you need dramatically less to live on. That means in retirement you’re highly likely to be in a lower tax bracket. Good to hear you’re maxing out that 457! I know I’ve been writing a lot about “Biglaw” salaries lately, but I promise this site will develop into one for all lawyers. One of my biggest lessons here is that it’s a false question between 401(k) and paying down debt when you have a Biglaw salary. You should be doing both. Thanks Tristan! Appreciate the comment. Between the two of us, maybe we can take the best of the Aussie system and the US system. 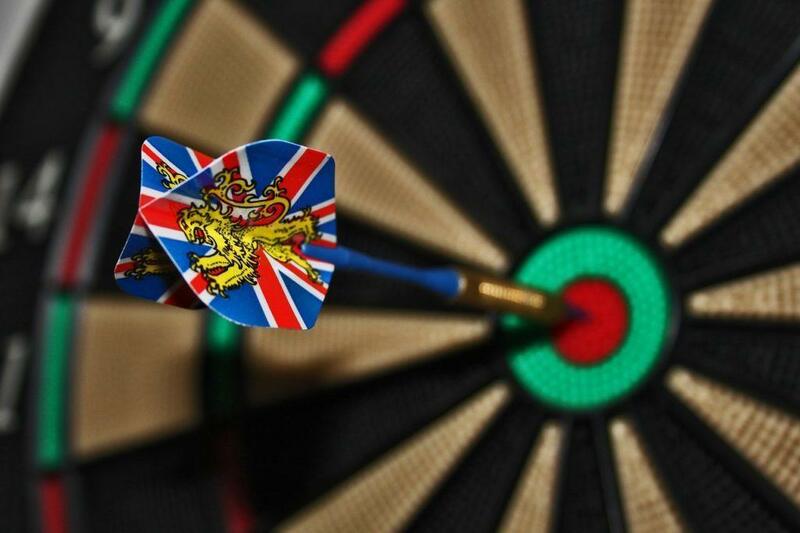 I’m going to take a look at your article on stock picking vs index investing in Australia. I don’t regret maxing out my 401k before I paid off my debt. I wish I had started maxing earlier! I also found the index fund that tracks the S&P 500 and it had the lowest expense ratio offered by my plan. I have since left my employer and rolled over that money into Vanguard with even lower fees. I now contribute the max to my new employer’s 401k. And that’s why you’re a boss! The tax arbitrage + expected equity return will likely beat the interest on student loans. But then again, the equity return is uncertain, while paying down the student loan is a 100% certain return. I can see some people would prefer the certainty of paying down the loan. But: If you factor in the company matching, you definitely want to contribute to the 401(k). So, for risk-averse, should probably split the difference and contribute to the 401(k) up to the company match. Thanks for leaving your comment and bringing up this point. For the risk-averse, I can certainly see the benefit to paying down the debt. And many, many lawyers are risk-averse. It’s exactly what I did during my first three years in the practice of law. In retrospect, I realize I made a mistake and it’s one I’m hoping other people will avoid. My marginal tax rate is 45.848%. My effective tax rate is ~35%. So even if I were to contribute money today and withdraw in NY, I’d be saving 10% of the difference through the tax arbitrage. This crushes the interest rate on my student loans without even considering the expected equity return. Given that it’s highly likely I will retire in a place not named NYC, the arbitrage is only going to be greater. The only thing that could possibly derail my plans are if my income in retirement is higher than it is now — and that seems like a good problem to have. What I really learned is this: do both if you can. Max out your 401(k) AND pay down your student loans. Hi, I may be missing something here but I don’t get how you pay taxes at effective rate when you withdraw. In your example of withdrawing now in NYC, won’t you be paying taxes at your marginal rate? – withdrawal amount will be on top of your current salary (kind of like bonus) so it will be taxed at your marginal rate. Obviously tax arbitrage works if your retirement income is lower and/or you move to lower tax states/cities. I am still new to this FI movement but I am beginning to become a believer. Thanks for starting this blog! Agree completely. Especially for highly compensated people, lawyers, doctors, finance folks, the trade-off is not so much 401(k) vs. student loan repayment. You max out all the tax-advantaged stuff and in the end it’s between the taxable account vs. student loans. Then the student loan repayment might actually win for the not so risk-averse people. Thanks for leaving the link. I’m going to see if I can digest that spreadsheet. 🙂 Looks like a lot of work went into it. Will you please go to every law school and teach this? Maybe I’m the only one, but I really feel like I didn’t understand just how big of a drag taxes were going to be on my life until we started actually earning an income (dentist hubby, me lawyer). We have been seeking ANYTHING we can do to take the edge off our tax burden. Paying off six figures of debt and also being nailed by taxes is more of a burden than I ever imagined! You are not the only one by far (it’s basically everyone). Retirement accounts are now your friend and learning the tax code is a worthwhile use of your time since you’ll end up keeping thousands of dollars if you live your life like Uncle Sam wants you to. I was in a similar position and I had to do the same. I hope this blog will be of some help! Great charts! 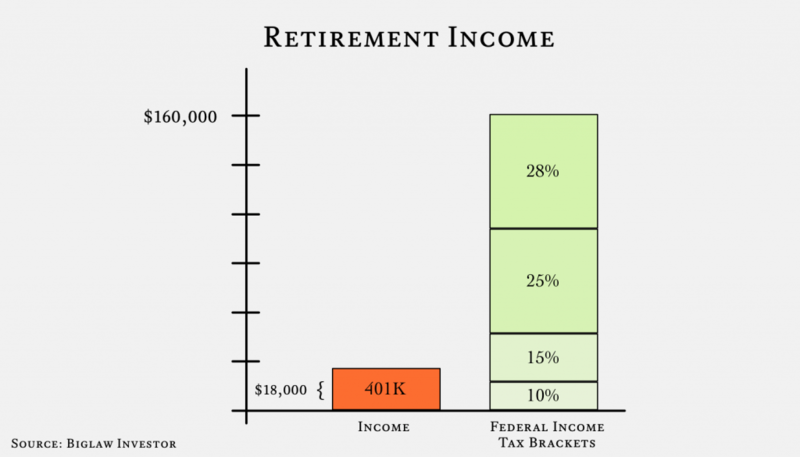 I especially like the bar charts with the 401K amount and tax amounts side by side. I started maxing out my 401k back in 2000, during my first full year of work b/c I had to GET OUT! I knew I couldn’t last in banking for my entire career so I had to save. Also, I went to William & Mary in-state, where tuition only cost $2,800 a year. Once you start maxing out your 401k, it become second nature and easy. Sam – You speak the truth! If you have a high income, $18K is a drop in the bucket (particularly since you’re paying with pre-tax dollars), so it takes only a few months to adjust and then you don’t even notice it. Is your example assuming all pretax contributions at the highest marginal rate (28% in your graphic) and all withdrawals in retirement at the lower end of the effective tax rate spectrum (10 to 15%)? Also, why can’t you just compare this apples to apples (i.e. pre-retirement effective rate vs. retirement effective rate)? Thanks in advance for any insight here! Terry – You’ve got it right. When you contribute to a 401(k), you effectively reduce your income by the last dollars earned. 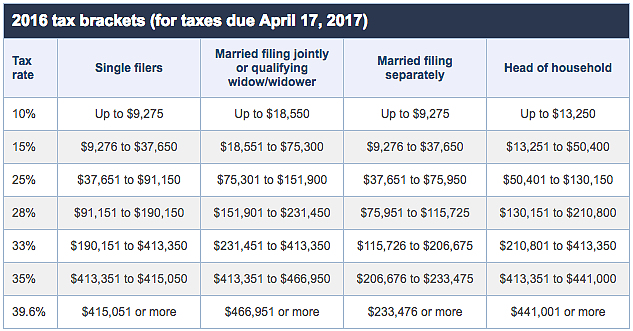 This has the benefit of saving you money at your marginal rate because now you’ll have $18,000 less dollars taxed at that highest tax rate. When you withdraw the money in the future, you first have to fill up the personal exemptions and standard deductions (all money that you get tax-free) before you start withdrawing money at the 10% tax bracket. This is why the tax arbitrage is so good, particularly when you are a high earner in a high income tax state that will retire to a low tax state. Last dollar reduced now, last dollar added later. Seems the calculus should always be the marginal rate. Also, reinvested dividends are not taxed in a 401k. That is a meaningful amount of money at retirement if you don’t contribute for 3 years to pay down the debt a little bit faster.